Bathroom mold tends to grow in rooms with poor ventilation. If mildew is proving to be a problem in the bathroom facilities of a building in Pompano Beach, FL a building owner or manager can take several steps to stop this fungus from growing. Mildew thrives in damp and stagnant conditions. In addition to a regular mildew clean routine, a bathroom may require a few upgrades. Increasing airflow can reduce moisture levels in a bathroom. Proper ventilation is crucial for preventing mildew and mold. Take measures to limit the amount of moisture left standing in bathrooms. Consider installing splash guards on sinks or shower enclosures. 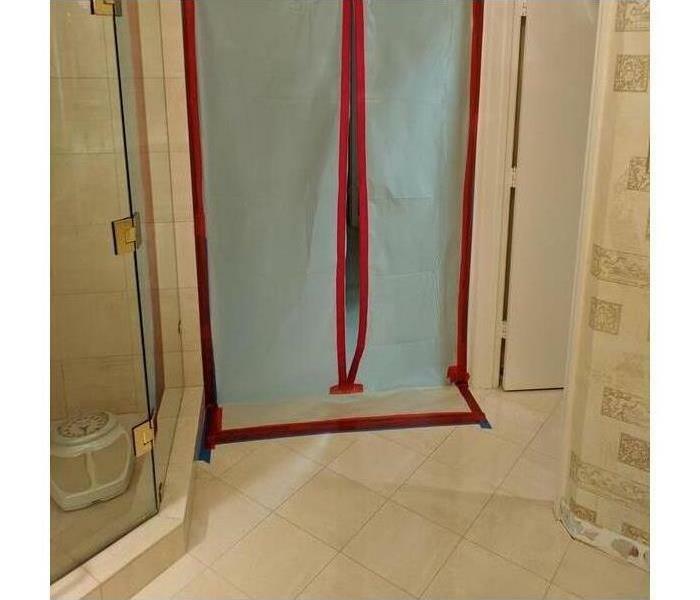 If showers have curtains, make sure that liners hang inside enclosures. Use grout to prevent leaks, including leaks behind tiles where mold may form. Every bathroom should be cleaned and disinfected every day. Depending on the number of building occupants or the level of customer traffic, it may be necessary to clean a bathroom several times a day. These measures can stop mildew growth in bathrooms. Building owners or managers may want to recommend the use of a mildewcide during a mildew clean. If a musty odor persists, mildew or bathroom mold may be hidden. Contact a testing, cleanup and remediation service in Pompano Beach, FL. A public library is a beautiful thing – and it is not just the public library that stores books in Pompano Beach. Many businesses such as law firms or educational establishments have a library that is a vital part of their company. Naturally, you do not want your business’ or institutions’ books to get wet, and in the event of water damage, it is natural to panic. However, professional water removal in Pompano Beach can help preserve and save books. Even books that are entirely soaked might be salvageable using a robust process known as freeze drying. First, documents are freeze dried to preserve their current state. Then, we place them in a specialist freeze-drying chamber, and all air is suctioned out. A combination of pressure and temperature are used to evaporate water and collect it outside the chamber. SERVPRO understands that the sight of wet books and papers is upsetting and it is natural to want to take action as soon as possible. However, we recommend caution and offer the following guidelines. Stop water flow if it is safe to do so, to prevent further harm to delicate books. We suggest taking unaffected papers to another, drier, location if you can, to prevent them from being affected. It is essential that the affected area is kept dry and cold. We recommend using a dehumidifier if possible to reduce humidity. You can use a fan for moving the air and aiding the drying process. Do not panic if you do not have access to the correct equipment - our IICRC-certified technicians arrive equipped with dehumidifiers and fans ready to do the job. Be very careful with water-logged books. Do not open the volumes, remove their bindings, or fan the pages. Handle each item as little as possible until our staff arrives. If water is still dripping from a leak or broken pipe or roof, spread plastic sheeting over collections to protect them from drips. Swift action is vitally important. The sooner books are frozen, the higher the chance of salvaging them successfully. That is why we recommend putting in a call to SERVPRO as soon as you can. Our IICRC-certified technicians are ready to remove water from the floor, reduce humidity, encourage evaporation and, most importantly, carefully take your books for freeze-drying. For help with wet books in Pompano Beach and surrounding areas, call SERVPRO of Pompano Beach at (954) 970-4942 today. No space in Florida is impervious to the effects of water. Our humid climate and seasonal storms enhance the risk of moisture damage in all places, including those devoted to memorializing our unique culture, the arts, and famous personages who made Pompano Beach their home. Aging plumbing and operator error or mechanical malfunction may affect these properties, too. When damaging water jeopardizes these special destinations and needs removal, we have all the resources to make it happen. A continually running toilet flooded gallery and administrative areas of a landmark, requiring commercial water removal in Pompano Beach. The housekeeping staff could try to mop up the mostly “clean” water, but the quantity involved needs the attention of a firm specializing in water removal and extraction methods. Our professional focus is firmly on providing the most thorough commercial water removal services possible, and we train our workers and purchase state of the art equipment accordingly. The surfaces affected also include carpeted areas, tiled and terrazzo floors, and woodwork. SERVPRO crews have experience in managing water removal from all these areas, and each member of the crew sent to your water emergency has IICRC certification in the theory, planning, and delivery of water removal services. One crucial skill we offer that ensures a successful outcome is structural and content moisture measurement. Our technicians train till adept in determining how much moisture remains in building materials and components after removal of standing water using precision instruments and advanced scanning equipment. They calculate drying targets and monitor the moisture levels until their efforts meet the target. Standing water responds well to pumps and vacuum extractors. The residual moisture needs weighted extractor wands, air movers, desiccant humidifiers, and sometimes the addition of heat to move moisture out of carpeting, woodwork, and subflooring and into the air where it can be condensed and discarded. The HVAC system also needs checking, and if unaffected by the flood, be brought back online to help balance the ambient humidity in the building. SERVPRO workers inspect for any indication of microbial activity as the priceless books, artwork, and documents housed in the center’s rooms are sensitive to any rise in the humidity which could cause mold damage even in non-saturated materials. Let the experts manage water removal for your cultural venue. SERVPRO of Pompano Beach has staffed phones at (954) 970-4942 round the clock. How can we help restore the integrity of the walls and other parts of your home during mold remediation? We use Sporicidin, an antimicrobial coating developed to last a while. Sporicidin® Mold Resistant Coatings - 80 is an easy-to-use, water-based, permanent coating developed for remediation and flood damage restoration. Sporicidin® MRC – 80 incorporates state-of-the-art sealing nanotechnology and an EPA registered antimicrobial* that delivers long-term, residual protection from excessive moisture and protects the substrate from moisture intrusion and protects the film from mold, mildew, and odor-causing bacterial growth. Sporicidin® MRC – 80 quickly penetrates and adheres to porous and non-porous surfaces and leaves a durable, long-lasting barrier that will not blister, peel, crack, or chip and restores the integrity of water damaged materials. Water damage such as plumbing leaks, floods, sewage backup, storms, and appliance malfunctions all cause sudden loss to your pet supplies store. Getting it cleaned up and back to its normal state is your priority, as should be the same for any water damage remediation company you hire. At SERVPRO, we lower interruptions to your business operations and do all that is possible so you can stay open during the process of restoration so you can keep providing for your family and employees, and of course our furry friends. Dehumidifiers have an important role in the water damage restoration process. They are used to make the drying process a lot quicker. Once air movers have evaporated hidden moisture into the air, dehumidifiers then eliminate that moisture. Many of the dehumidifiers that SERVPRO uses come with sensors that monitor performance for automatic variable fan speed adjustments. Dehumidifiers work like sponges by pulling in moist, humid air and discharging dry, warm air. Most dehumidifiers work similarly to how air conditioners regulate humidity. They pre-cool air that's coming in before it passes over cold evaporator coil. Then, the cold coil condenses water vapor into water that collects into a pump that is removed by an automatic pump-out system. After a short time of these machines working together, your home or business will be free of moisture and the threat of dangerous mold. At SERVPRO, we are also sure to keep each job free of contamination by changing the filter after each job if mold or other sign of contamination was possible. The SERVPRO drying process is just another way that we help make it "Like it never even happened." Does Your Pompano Beach Business Have A Commercial Mold Problem? Contrary to popular belief, all types and amounts of mold can effect health. The key to better health could be finding where the mold is. If you smell any sort of "musty" odor contact a mold professional right away. Moisture can be locked into wood floors, carpets, bathrooms, kitchens, and literally anywhere in your home. Simply cleaning the mold with bleach or any other disinfectant won't do the job, the mold will only be hidden and not completely eliminated from the environment. Sometimes remediation and reconstruction may be necessary to get rid of the mold altogether. If you have been a Florida resident for a while, you know that summertime brings weekends at the beach, warm weather, tourists, and lots of rain. Specifically, summertime marks the beginning of the hurricane season. Hurricane season in Florida spans from June to November each year. This is the period of time during the year when the seas are at their warmest and the air is the most humid, creating perfect conditions for a hurricane to develop. After a storm, if your home has experienced storm damage, be sure to call SERVPRO of Pompano Beach at (954) 970-4942 and let us help you make your home whole again! We are on call 24 hours a day, 7 days a week. Living in Florida, we face the seasonal and dreaded threat of storm damage. For most Floridians storm preparedness comes easy but if you've recently moved here, it can become overwhelming. However, with a good understanding of hurricane and storm preparedness, you and your family can be sure to better protect your home from the next storm. To be better prepared for a storm you should be prepared for both before and after the storm. Before a storm hits, it's important to have your emergency supplies stocked and ready to use. There's no better way to have an emergency supply kit done than doing it a little bit at a time. Starting new every year in January will give you plenty of time to be prepared for hurricane season in June. It's also a good idea to have a "go bag" ready so that if you need to leave on a short notice you're not scrambling around finding your clothes and essentials. Consider investing in impact-resistant windows and glass for your home, that way you won't need to worry about putting up shutters before a storm hits. At the same time, getting a storm bar for your garage door will help reinforce it's structure. During a storm, a garage door is usually the first structural element to fail. Keep your landscaping maintained throughout the year by removing dead trees and plants and trimming trees and plants that have been overgrown. Waiting until hurricane season to get your landscaping maintained will cost you more money and may not be able to get done before a storm hits if it's put off too long. Make sure that your home's rain gutters are secured and cleared to prevent water damage. Just as it's important to prepare before a storm, being prepared after is equally important. If you evacuate only go home after the storm has hit and when your local governor has declared it safe. Coming too early can turn deadly if you run into flooded roadways and falling trees. Report any downed power lines and avoid walking through any flooded walkways or roadways. If your roof has suffered damages, use tarps to cover it from further water coming in. If your home has broken windows, use plywood to prevent further water damage. One last step to better prepare for after the storm is to take a picture of all damages to better assist when making insurance claims. While you were enjoying the final weeks of summer with family and friends north of your dream home in Florida, your beloved ocean view condo or lakeside estate was right in the path of a Hurricane. The high winds, rain, and storm surge may have taken a significant toll on your winter getaway. Without knowing if or how badly your vacation home was affected it is impossible for you and your family to look forward to another season in the sun. The extreme weather pattern that defines a hurricane threatens Pompano Beach area houses, townhomes, and condos purchased by residents of cold weather states as winter retreats. You and your family richly anticipate the time you spend in the warmth and the sun now that you added a Florida retreat to your lifestyle. That joy is now tarnished by your fear that your hard-earned vacation home has been harmed by the force that was a major Hurricane. Winds exceeding 100 miles per hour can devastate roofs, exteriors, doors, and windows. SERVPRO tip: even less noticeable damage can allow rainwater and storm surge to invade your retirement refuge. Perhaps you have been in contact with neighbors or building managers and have been assured everything looks good on your property. You still need to take the possibility that rainwater may have made it into your Florida winter home seriously. Relatively small quantities of water can cause significant damage, especially as you were not at your Florida home when the storm hit to ensure the water was removed and the structure dried. Your lifestyle allows you the freedom to enjoy more than one area of the country over the course of the year, but you do have to plan for some surprises when you move from one home to the other. If Irma’s winds and rains forced their way into your home primary and secondary water damage may challenge a happy homecoming. Before you pack up for the seasonal move to Florida, SERVPRO advises you to consider making a quick pre-trip to preview how well your dwelling kept the winds and waters at bay. Another idea may be to reserve a room at a local hotel, so you have a fall-back position if you discover when you arrive that Irma and her rain-laden winds caused some damage to your house. 4/9/2019 - Does Your Pompano Beach Business Have A Commercial Mold Problem? 4/8/2019 - Hurricane Season is Coming!